When we first began our search for the perfect camper (it’s like a unicorn, btw…) we looked at the pros and cons of a variety of styles. Did we want a truck camper? A travel trailer? A pop-up? What would work best for our needs? No matter what we settled on, there are plenty of pros for each type of camper and cons for each one as well. So, what are the benefits of a truck camper? 2. Don’t like to tow? You don’t have to! 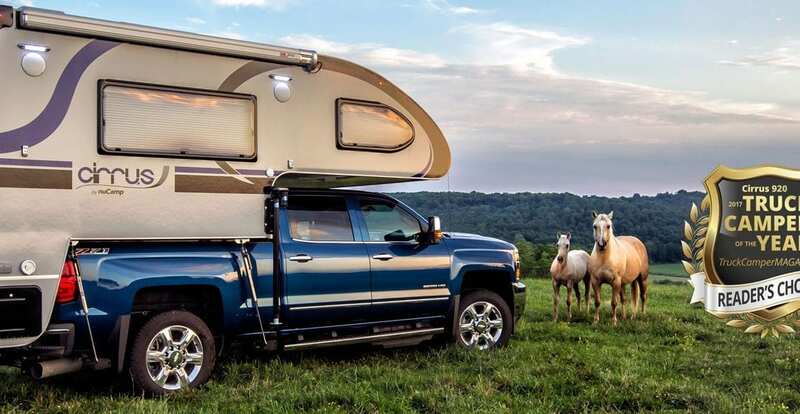 Truck campers make it much easier to maneuver through a city or down crowded interstates because everything is right there in the back of the truck. You aren’t thinking about your truck plus the travel trailer or fifth wheel following along behind it. For some people, this is a huge benefit to travel trailers. 3. If you DO want to tow something – say your boat trailer or 4wheeler trailer, you can! Hook up that boat trailer, drive to your favorite lake spot for fishing before you set up camp, and enjoy the ease of not only towing your boat trailer, but also unloading the boat! 4. Truck campers have less maintenance than travel trailers or motorhomes because they have less parts – no wheels, no engines. Also, MOST states consider truck campers cargo, not RVs, so you don’t have to register them. This helps save money and hassle too! 5. Truck campers are easier to store. If you live on a small lot you might not have enough space to store a 25+ travel trailer. You probably DO have room to store a small truck camper though. 6. If you do end up staying in a campground, your truck camper is more versatile. You don’t need to make sure that your campsite is 40′ long. You don’t even have to unload the truck camper! If you’re planning to stay for several days, sure, you might want to, but otherwise? Just back the truck in and you’re done! There are many benefits to truck campers. We know they aren’t for everyone; if you need to sleep more than 2 or 3 people, you’ll want something larger. If you plan to live full time in your RV you may want something with more storage. For weekend warriors who already have a truck and really want to get out and explore? A truck camper could be just the right option for you! Check out our Northstar Truck Campers and our NuCamp Cirrus Truck Campers for two very different truck camper options!